Over the past year I’ve reviewed a few optical heart rate monitors that allow runners to do away with the traditional chest strap. Both the Mio Link and Scosche Rhythm+ performed well, though I preferred the latter due to the fact that its fabric band was more comfortable and allowed it to be placed in a variety of locations on the arm. I’ve also reviewed a few wireless bluetooth headphones, with my favorite being the Jaybird Freedom for its combo of decent sound, great fit (stays in place really well), and low price (under $60). Just prior to Christmas I received a package from Jabra containing a pair of their Sport Pulse headphones (Disclosure: these were a media sample provided free of charge by the manufacturer). 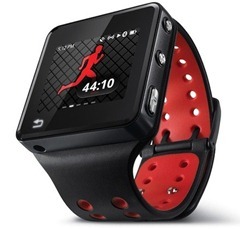 This device combines a wireless bluetooth headset with an optical heart rate monitor (HRM). I love gadgets that combine functions of things that I use regularly (and I use HRMs and bluetooth headphones regularly), so I was excited to give the Jabra Pulse a try. I’ve now been using them regularly for a few months, and overall my experience has been mixed. With a bluetooth headset my main areas of concern are fit, sound quality, battery life, ease of connection, and connection stability. For the most part, the Jabra Pulse does quite well in all of these areas. 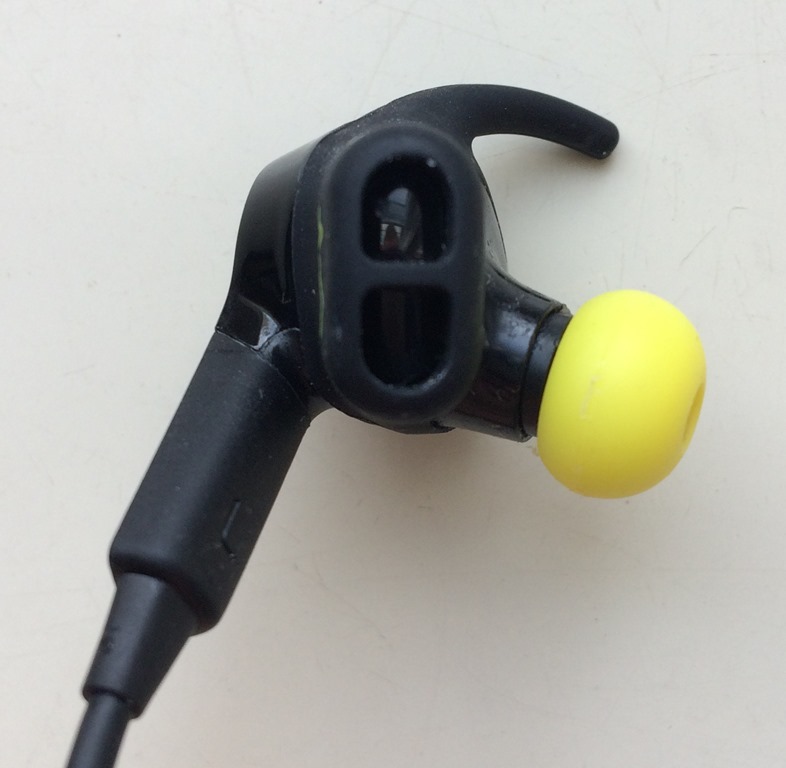 Fit is highly customizable with a variety of earbud attachment sizes/options (see photo below). I have not had them fall out of my ear during a run, but I don’t feel like the fit is as secure as it could be as I often have to push them back into my ear canal (I’ve tried several of the earbud attachments). In contrast, my Jaybird Freedom earbuds stay put really well. Sound quality is good for a wireless headset – I’m no audiophile, but no complaints here. I’d say it’s comparable to the Jaybirds. I like that I can control volume and advance/reverse songs using the controls built into the headset wire. Battery life has also been solid. Jabra estimates about 5 hours of listening time for the Sport Pulse, and I have no major complaints here either. I have not done a battery rundown test, but I can generally go a week or so between charges and I have not had the battery die on me mid-run. This is encouraging given my poor experience with the battery life of the Jabra Sport Wireless+ headset. Syncing with my iPhone works flawlessly – simply turn bluetooth on in the phone settings and the Jabra Pulse will be identified. After the initial sync, the headset gets picked up the moment you turn them on, no need to go back into your phone settings (bluetooth must be on though). 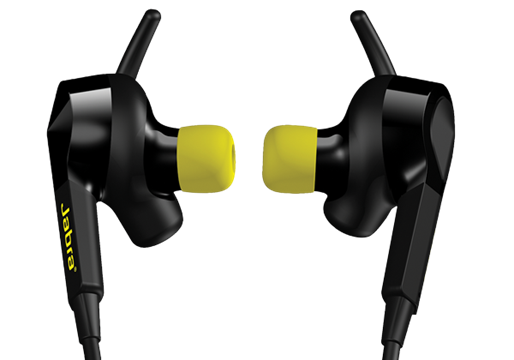 You can use the headset with the Jabra app, but I prefer to use them with iSmoothRun (my preferred running app). 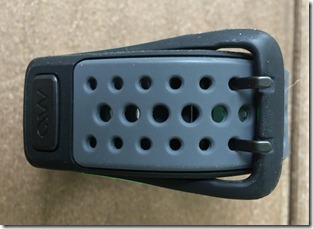 iSmoothRun recognizes them as a heart rate sensor and they pair without issue. On the run I have not had major issues with connection dropouts for audio – occasionally music will cut out for a moment if I turn my head, but this is not a common occurrence (my iPhone has typically been in a jacket chest pocket this winter while using the headset). So the Jabra Pulse has lots of fit options, decent sound and battery, and syncs easily with my phone. Sounds great, right? Unfortunately, things start to fall apart with the heart rate monitor. Crumble into dust might be a better way of saying it…. First off, the Jabra Pulse only connects via Bluetooth Smart. This is fine for music, but I never look at my iPhone while running, so seeing a real-time readout of heart rate would require the ability to sync it with my Garmin 620 or my Vivofit. Unfortunately the Jabra does not support ANT+ (the Mio Link and Scosche Rhythm+ both support ANT+), so I cannot display HR info on either device. You’d know this before making a purchase, so this isn’t really my big knock on the HR function. It’s worth emphasizing however: don’t buy the Jabra Pulse thinking you can pair it with your Garmin watch – it won’t work. The bigger issue I have with the heart rate functions of the Jabra Pulse is that it simply does not work that well. The device measures heart rate via an optical sensor built into the earbud (see photo at left). Presumably this analyzes blood pulsing through the skin of the ear and uses this info to calculate heart rate. Unfortunately, the signal is unreliable with tons of dropouts, and at times the reading is way off what I would expect for a given pace. In fact, I’ve had almost entire runs where the heart rate is not even close to where it should be. Let’s look at some comparison plots comparing HR data from the Scosche Rhythm+ and the Jabra Pulse. The Scosche data comes from my Garmin 620 via SportTracks, and the Jabra data comes from iSmoothRun .tcx file export into SportTracks. First is a plot from a recent 10K run in which I pushed the pace a bit in the final mile. The first plot below shows data on pace via my Garmin 620 and HR via the Scosche Rhythm+. What you’ll notice is that the HR plot is fairly smooth with no dropouts, and HR moves up a bit toward the end of the run when I picked up the pace. Next we have the same run with pace data from my iPhone and HR from the Jabra (I couldn’t get the scale to be quite the same). What you’ll notice on the HR plot is over 20 dropouts. Even worse, after mile 2 or so the HR line hovers around 185 bpm. This is approximately my maximum heart rate, and I can assure you I was never even close to that high on this run. Something is very wrong here! To further illustrate the discrepancy, here are my average heart rate values for each mile split obtained from the Scosche Rhythm+ – note that all are under 180, and only the final split (from the final 0.2) comes close to 175. These values seem consistent with my normal range for the effort expended in each split. Now the Jabra – mile one was reasonably close to what the Scosche reported, but then things fall apart. By mile 4 I was apparently almost maxing out my heart rate, and mile 6 plus the final 0.2 were similarly high. These numbers are way off reality, and I have no idea why. Again, smooth HR line, no dropouts except maybe a little downward spike near the end of the run. Average heart rate for the run was 158, which sounds about right for the effort level. I’m not even going to try and count the dropouts, and the heart rate line in this case never goes above 115. Average heart rate reported by the Jabra was 92. If I could run 7+ miles at 8:00/mile pace with an average heart rate of 92 I’d be pretty impressed with my current fitness. Again, something is wrong here, and this time the readings are way too low. One thing I’d also like to add is that though the plots for the Jabra were exported from iSmoothRun, I have also noticed weird heart rates that were way off what I expected when using the Jabra app. So what am I left to conclude? Either I got a real lemon of a headset, or the Jabra Pulse is simply not up to the task of recording heart rate in a stable or accurate way on the run. As a result, I am unable to recommend this device if you are interested in its function as a heart rate monitor. My suspicion is that it’s rather difficult to keep a sensor seated firmly enough in the ear to produce a stable recording, and that for optical HR a wrist or arm band that can be cinched tightly to the skin is the way to go. The Jabra Pulse is fine for music, but there are options out there that are much cheaper than the $199 price tag for the pulse. For example, you can pick up a Jaybird Freedom bluetooth headset (under $60 at Amazon) and a Scosche Rhythm+ optical HRM (just under $80 at Amazon) and still have $50+ dollars left to spend vs. buying the Jabra Pulse. And with that combo you’ll be able to listen to music without wires and get a stable HR recording that will also sync with a phone or a Garmin watch if you have one. To me it’s a no brainer. With bluetooth smart, it will be compatible with the new line of Suunto Ambits. 🙂 Too bad about the unstable recording, though. Great review, Pete. Unfortunately, there are a lot of products that just don’t live up to their promise. I’m testing the Sony Smartwatch 3 now and its GPS track is very inaccurate. Had me running backwards and across a pond yesterday. Have you been in conact with Jabra about this? They claim an accuracy of 99.2 % compared to EKG, so it would be very interesting to hear their reply to this. I’d be interested to know how they tested that to get that number and if it was done while running. I suspect that a big part of the issue may be how stable/secure the fit in the ear is, and while running things move around a lot. I’ve had the Jabra for a few months now, and I have to say its HR sensor works very well, with very few drop outs if any. On average, it the values it gives may be sligtly above those from my former micoach chest strap, but results are consistent one run from the other, and within one given run. The jabra seems to lack some reactivity – for instance during interval training, it takes a little longer than the micoach to account for the HR decrease. I’m being a bit picky here. To me the best thing about the jabra is the comfort and secured fit they provide. I’ve tried many other earbuds (those are the first wireless though) and none of the previous gets even close. while they are “locked” in your ear, you really need to pull the cord to make them budge. To get this comfort, you really need to ensure you have the best combination between the yellow buds and the black “fins”. I’ve just run a full marathon with them and almost forgot I had them one, except for the playlist I had prepared. In a nutshell: pricey, but they deliver. This was a very good review. I love the headphones for audio. But the measurements are way off. I kept getting readings in excess of VO2 max (162) and my maximum heart rate. I stopped in my tracks. Part of the reason that I use the heart monitor is that I am an older runner and want to make sure that I don’t get overly aggressive. I tested simultaneously with the iPhone measurements for pulse and the pulse wasn’t even close. 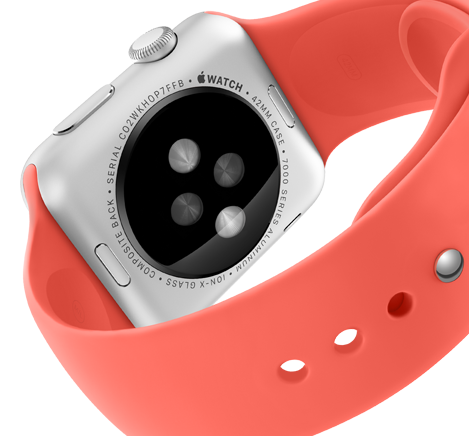 I am going to test it with a smart watch as well, but my strong suspicion is that the Pulse is wildly off on the heart rate measurements. interesting. I’m just finishing off my review. I get likely >99% accuracy compared to Garmin HRM-RUN. then again whenever I fiddled with the Jabra earbuds the reading either dropped out or went too low. on the whole the Jabra was on average 1bpm higher. maybe they’ve changed the firmware? Could be that they just aren’t a good fit in my ear. I have used for a few weeks now. When comparing the heart rate function with my Garmin 610 (and a new belt), the results are desastrous. Much too high. I am constantly running above my max heart rate. There is a difference of around 40 heart beats. Way too much. I cannot trust it …. Your review is excellent & very accurate, I’m very disappointed with the earphones, I’ve been trying so many wireless sport earphones and I gave away my Powerbeats2 cause they were cutting off and did not fit my ears well. I have to say that these headphones fit me perfectly but the heart rate is useless it is so far off, I get maximum HR through out my run. I was very excited about those earphones, but they are terrible. They keep disconnecting, the Bluetooth never pairs with my iPhone and discharges very, very fast. And the worst part, it supposed to help me do my exercises, but it is compromising my exercise routine as I can ever count on having music to listen. Besides that it is not charging anymore, I bought those phones in early October, and we are only in December, and they are already useless. It impressed me how many people have given this product a 5-star rating even with so many complaints about its functionality. 5-stars are for perfect products. This one should be taken out of the market for improvements, lots of them. I’m on my 3rd pair of these in a year. My problem with them was a sudden inability to charge them. To Jabra’s credit they have exchanged them without issue under warranty, even sending out the replacements before they’d received the defictive pair. I’ve been using my current pair without problem for about 3 months, but it does appear they had some quality control issues in mid 2015. I think the HRM is fairly accurate for me, but as others have noted they fit very snugly for me and don’t bounce around much. Looking back at my graphs there are no dropouts. I’m using them with a Droid Turbo so can’t speak to iphone issues. I’ve just got a pair of these and so finding the hrm wildly inaccurate, which is a shame as that’s what I got them for. I am going to try with larger ear wings and see if that helps. If my heartrate was as high as it’s telling me, I would be dead. I am surprised so many peopl give good reviews. Maybe they aren’t bothered about the hrm, as the rest of it is fine. I wish I’d read your review first.